Today we released an update to Novapress Pro; our viral news blog theme. With Novapress start your own viral news blog or viral content business. It’s inspired by Viral Nova and designed to help boost social shares and get you more viral traffic from top social media websites. It features a responsive grid layout, infinite scroll, mailchimp forms support, facebook comments support, social sharing buttons, social icons and 3 custom ad spots to monetize your site. This release fixes several issues. See the list of changes below. Added posts navigation on index, category and archive pages. Fixed posts navigation issue on home page. Fixed issue with infinite scroll on home page. Added ability to set font type and weight for titles and body text. To update your theme; log into your website’s Admin Dashboard and go to APPEARANCE > Themes. 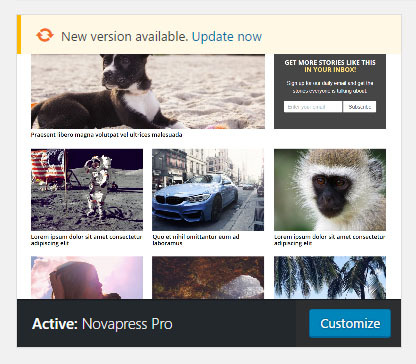 Then click the “New version available – Update Now” link for Novapress Pro. If you are using the free version – Novapress Lite – upgrade to Novapress Pro today and save 10% with coupon code THEMELY10.